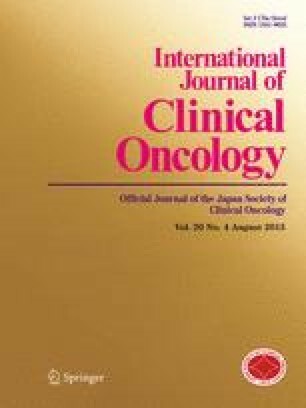 This single-arm, multicenter, phase-II trial evaluated the efficacy and safety of hepatic arterial infusion chemotherapy (HAIC) using fine-powder cisplatin and iodized-oil suspension in patients with intermediate- and advanced-stage [Barcelona Clinic Liver Cancer (BCLC) stage-B and stage-C] hepatocellular carcinomas (HCCs). The Institutional Review Board approved this study and patients provided written informed consent. Thirty-five patients (24 men and 11 women, mean 74 ± 6 years [range 60–87 years]) with BCLC stage-B (57 %, 20/35) or stage-C (43 %, 15/35) HCCs who were not candidates for other locoregional treatments were enrolled. HAIC was performed using a suspension of fine-powder cisplatin with a maximum dose of 65 mg/m2 and iodized oil on demand. The primary endpoint was the response rate evaluated based on Response Evaluation Criteria in Solid Tumor (RECIST) and modified RECIST (mRECIST). Secondary endpoints were overall survival, progression-free survival, and safety. The initial and best overall response rates at 4 weeks and 3 months, respectively, were 14 and 17 % based on RECIST, and 57 and 23 % based on mRECIST. The median overall and progression-free survival times were 18 and 4 months, respectively. The most frequent grade-3 or grade-4 adverse events were elevation of serum alanine (23 %) and aspartate aminotransferase (20 %), and thrombocytopenia (17 %). This HAIC provides promising therapeutic effects with acceptable safety to patients with intermediate-stage and advanced-stage HCCs. On behalf of the Clinical Research Group of the Japanese Society for Transcatheter Hepatic Arterial Embolization. This work was supported by JSPS KAKENHI Grant Number 23591816. We thank the members of Institute of Human Research Promotion and Drug Development (Dr. Masakatsu Nishikawa, Dr. Satoshi Tamaru, and Dr. Tomomi Yamada) for their support with the data management and advice related to statistical methods. We also thank the members of the study committee for safety and efficacy monitoring (Dr. Shigeaki Narimatsu and Dr. Tsuneo Ishiguchi) and the members of the committee for efficacy evaluation (Dr. Hiroshi Kondo, Dr. Yozo Sato, and Dr. Hideyuki Nishiofuku).